about you? I had the opportunity to speak at one of our Blue Lodge meetings to spread the word about Shrinedom. With the help of some of the brethren in this lodge, I hope to see some new candidates. I was also invited to attend the annual meeting of the Grand Chapter Order of the Eastern Star of the District of Columbia. This was an event where I met many of the leadership of the order. You should know that Most Worshipful Jesse Villarreal, PGM was elected to the position of Worthy Grand Patron of the Grand Chapter. Be sure to congratulate Noble Jesse. Were you at the D.C. Grand Lodge semi-annual communication representing your Blue Lodge? I was. After taking part in the Scottish Rite Reunion, I had the pleasure of attending the wedding of our Chief Rabban Mike Gordon. Congratulations Mike and Vanessa. We remembered our departed Nobles at the Almas Memorial Service. A number of relatives of the Nobles remembered were present at this impressive ceremony. Next was a visit to the Veterans Center at Charlotte Hall. Many Masonic Organizations contributed to a fund to purchase a new large screen TV for our veterans. Thanks to all the organizations which made this possible. a pleasure and the food is excellent. Another Board of Director’s meeting and Almas Business meeting provided everyone in attendance a chance to take part in the future of Almas. How many Business meetings have you attended lately? an opportunity for those who enjoy the frustration and pleasure of a round of golf. Then I am off again to visit Irem Shrine where I will have the pleasure of meeting with my counterparts from other Shrine Temples. This is always a good event to discuss common problems and get some good ideas. Next it will be out to the Bowie Baysox baseball game. Twenty Nobles will be given the opportunity to obtain two free tickets to the game. See the ad on page 7 for all the information. I will be attending the Imperial Session in July as a representative of Almas. I look forward to visiting Tampa once again and being a part of this session. This is an opportunity to meet the members of Shriners International. This is where all the business affecting every Temple will be discussed and decisions made. I will provide more information concerning this Imperial Session at a later date. Then we will be off to the beach for the Mid Atlantic Shrine Association in Virginia Beach. Information can be found on page 10. Come and join us for the last ing of Summer. You can see that there are plenty of activities happening in and around Almas and I hope that you will take notice and become a part of some of them. 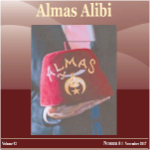 By the way, I have not heard from anyone concerning the presence or well-being of Al Mas. I have come to the conclusion that he has been kidnapped. I am now willing to put up ransom, payable to the Transportation Fund, for information leading to the location and return of Al.